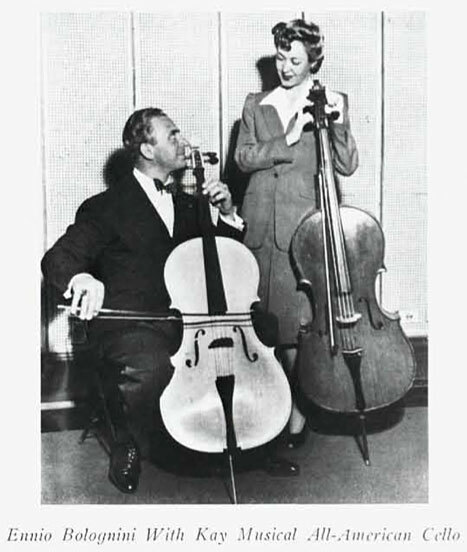 This first photo was from a 1941 Presto article on how Mr. Bolognini was so excited about the new "American" Kay cellos, all laminate of course, and how they're just as good as (carved) European imports. I might disagree with that, but the part I will agree with is that they sure are durable and practical and sound just fine. The gist of the article was that he was glad to have them about, because with the war going on "across the pond," access to new European imports wasn't there. I spied this Kay upright ad in another Presto from 1940. It's just too vintage-cool not to pass on. As always, the "clippings" posts usually originate from screen grabs of MTR/Presto archives material.